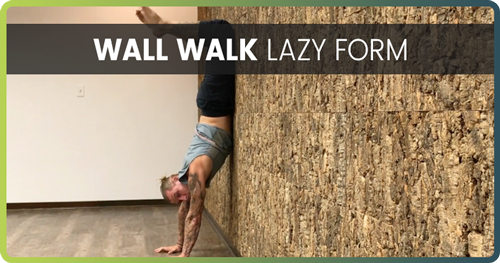 This Handstand tutorial will show you that learning how to do a Handstand properly isn’t as tough as you might think. We’ll break down the basic elements of Handstand for you and give you tons of tools you can use to start practicing today! With that said, let’s get started! Stacked grip wins. I repeat: Stacked grip wins. Sorry wide grip. You’re just a not functional hand placement in Handstand for developing strength and endurance over the long term. If you learned a wide-grip Handstand in Yoga, I totally get it. I was there too. The main problem with this grip is simply the lack of bone stacking. 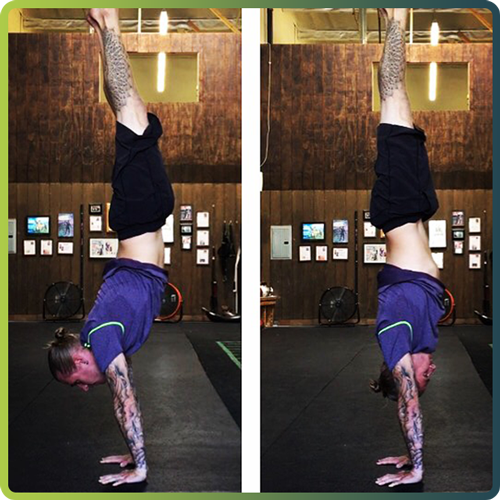 When you practice Handstand with hands wider than your shoulders, you are conditioning the compensation of other muscles that don’t necessarily need to be used. Said another way, it’s not the most efficient way to make the shape. Sure, you might find another tutorial on Handstand that tells you to muscle through it with wide hands…I’ll definitely challenge that school of thought because you can learn to Handstand way more efficiently by stacking your bones and using less energy exertion of your muscles, and thus hold a cleaner Handstand for longer. 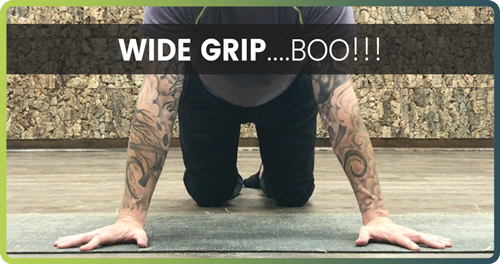 The items in the rest of this article leave some room for person refinement, but this is one correction I make over and over in Handstand students everywhere, and the moment they try the proper grip, it’s like they have a whole new Handstand in their pocket. If you ask 10 different instructors about the right hand placement in Handstand, you’ll get 10 different alignment cues…. Well….all of them. And none of them. For this Handstand tutorial, I prefer to make the #11 with my index fingers and spread every other finger from there (the 1st picture). It helps me begin to make a line with my joints because, spoiler alert, a clean Handstand is really just a stacking of all the joints up the chain. Thus, I like to start my stack with the very 1st joints in the arrangement. My ideal line connects my finger joints to my radioscaphoid joint (wrist joint on the inside when palms are face down) to my elbow to to the inside of my shoulder. 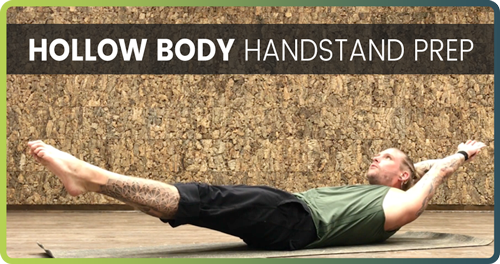 The best way to test your preferred hand placement in handstand is simply to try on a few different arrangements in Plank position. 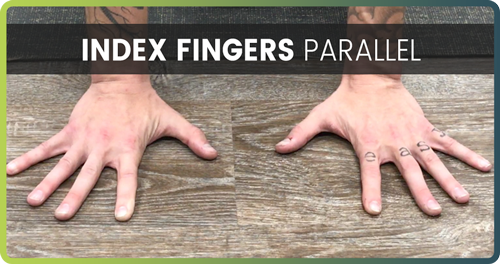 Your body is going to tell you the most natural position of your hands for weight-bearing exercises like plank, and eventually the progression to Handstand. 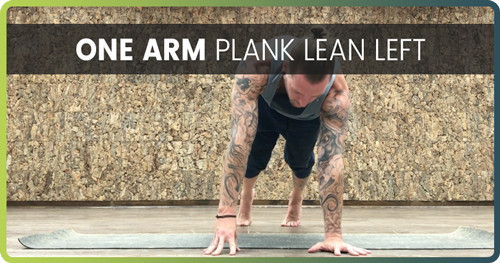 Hold Plank for 30 – 60 seconds in each hand position and take note of any sensation in the wrists and palm. Lean into the insides and outsides of each hand and eventually find the placement that feels the strongest. It’s usually a slight leaning inward towards the index finger and thumb side of the hands (the inside). With any/all of these different grips, one thing that remains constant is using spread fingers vs fingers close together. They should be wide enough to slide a nickel in between each pie slice that is made when the fingers are spread. 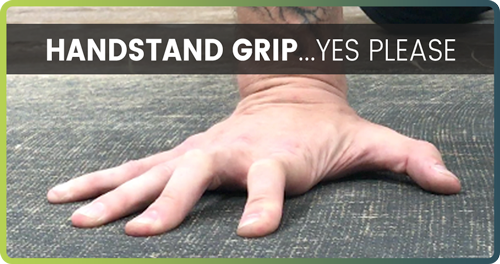 This allows you to grab more of the floor and get a better feel for your Handstand surface. Once you have your desired rotation of the hand and fingers spread, the final piece of the puzzle in learning how to do a Handstand is to grip your surface. This is one piece that I see forgotten all too often, especially in new students. 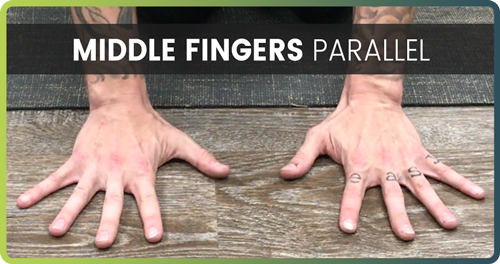 A flat and lazy hand is not the best base for weight-bearing exercises, especially one in which your entire body weight is coming down onto your hands. Thus, start to practice your Handstand grip. “Grab the ground like it’s a basketball”…..and I disagree. And yes, I’m guilty myself of having said this. 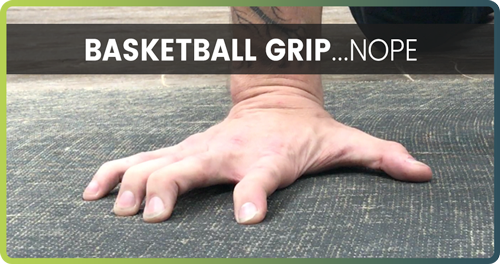 The obvious difference is the contact points to the earth and that the “basketball grip” doesn’t make much sense for learning how to do a Handstand. Sorry about that. 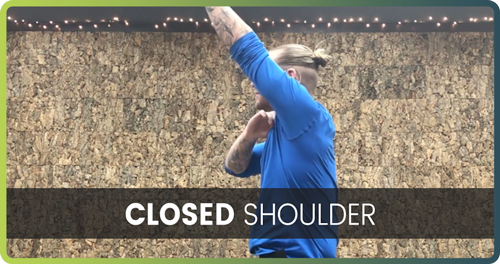 Got a little carried away there….With that said, I’m going to keep this tutorial deliberately focused on the aspects of the shoulder that affect you when learning how to Handstand. So this is definitely the first and foremost obstacle to work through when talking about your shoulders in Handstand. 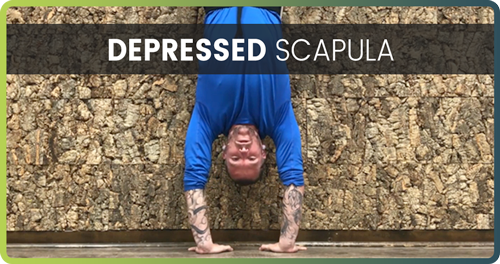 Now, unless you’re a seasoned Handstand practitioner, there aren’t many other sports that focus on shoulder flexion with the same intensity as our craft. So what exactly is shoulder flexion? To put it in the simplest terms, please refer to Dr. Google PhD for the layman’s understanding: A shoulder flexion is when you move your arms anywhere from a resting position by your sides to straight above your head. I like this definition a lot. Now the obvious difference between the two pictures is the overall shape….banana back vs straight line. And yes, your back plays a role in your Handstand, but it is not responsible for the massive difference in these two Handstand shapes. The real culprit here is lack of Shoulder Flexion….aka “closed shoulders”. Because the shoulders aren’t open, the rest of the body has to compensate to maintain balance. Thus, my center of gravity (my hips) are trying like to make their way over my shoulders to and get balanced. 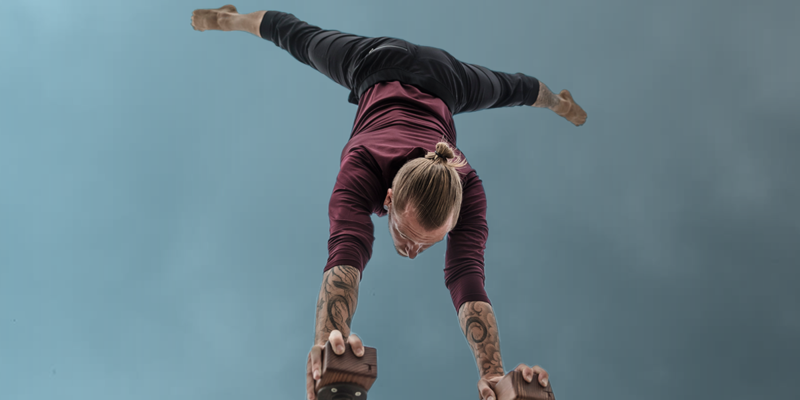 When you’re in the early stages of your Handstand practice, the obsession is on the balancing act rather than than overall efficiency of your shape. Unfortunately, this is the Handstand shape I see all too often in Yoga students and Crossfitters. 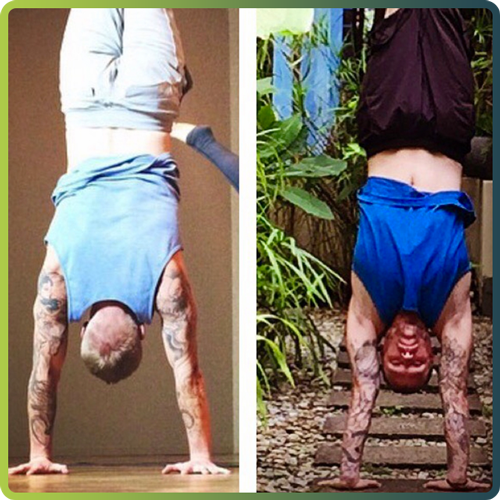 If you want to learn how to Handstand faster, get focused on opening your shoulders right now! It’s the guaranteed path to a stronger Handstand practice. I promise. 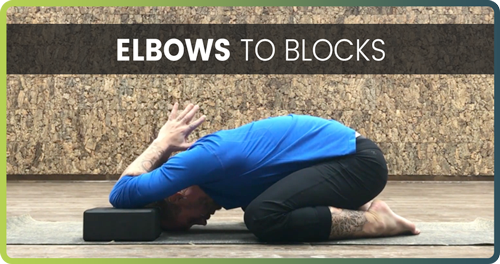 One exercise I’d like to share with you in this Handstand tutorial is a good old fashioned yoga stretch in which I come into Child’s Pose and rest my elbows on a couple of yoga blocks. 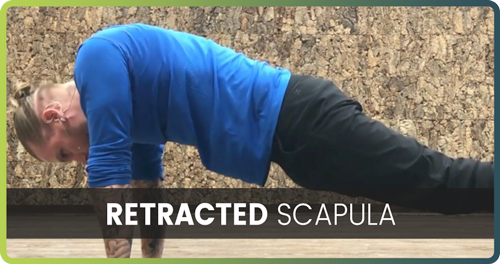 This is a super easy passive stretch to warm up your shoulders. If you feel good after the blocks drill, try playing with the next posture: Anahatasana. Again, another traditional Yoga pose we can blend into our Gymnastics practice of Handstand. This one involves you placing your hips over your knees and crawling your chest forward until it comes close to the floor. The important piece to remember here is that you want to crawl your hands as far forward as you can, and let your chest sink down to the ground. Again, a nice passive stretch. Ok. 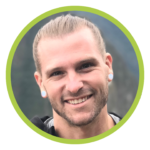 So now you’re a pro in shoulder flexion exercises, so it’s time to move on to the second part of this article….drum roll please…. 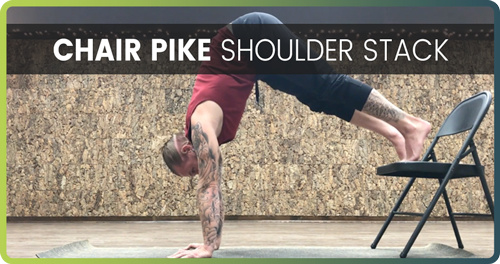 The other major piece that comes into the equation when talking about shoulder movements in Handstand is the ability to press…and no, I don’t mean “pike pressing a Handstand” like you think, although I will eventually cover that in later articles/video courses. What I’m talking about here is, quite literally, pressing down into the ground through muscular action in the shoulder. Your ability to press down has a direct impact on your ability to kick up or lift up into a Handstand. Another term that is used for this is the “Shrug”. My students hear me say it all the time. Shrug like hell and get taller through your trapezius! Now, while this is not the most technically accurate description of what’s actually happening anatomically, it’s a good mnemonic device for remembering what does what. These are an all-time favorite of mine personally. 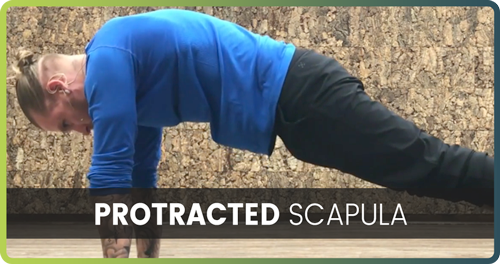 While Scapular Push-ups are a great warm-up drill, I find that I can really only use them for just that…warm up. Whereas Wall Shrugs are a great form of conditioning for all levels of student learning how to Handstand. That said, what I’d like to keep from the last drill is the press action. 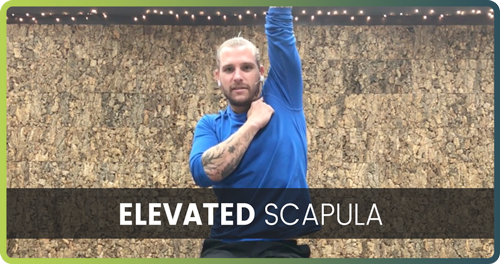 The only difference is that the press action now goes upward (or downward if you’re inverted), and they are now referred to as Elevation or Depression of the Scapula. 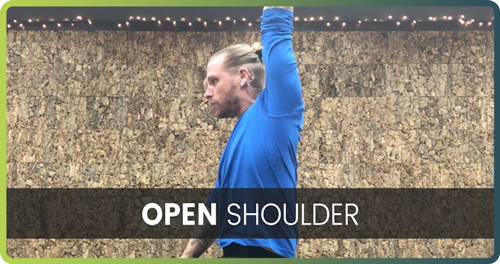 These simple shoulder exercises, when performed regularly and with intention, will help you develop mobile and strong shoulders faster than you think! Remember, learning how to Handstand requires you to 1) Make up your mind to do it and 2) Train smart using the proper drills and techniques. Now, along with shoulder flexion, no Handstand tutorial would be complete without Hollow Body. It’s the shape that you see whenever you watch a Gymnast do a Handstand. 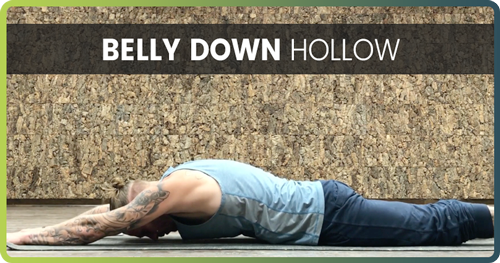 Follow along this video as we go through the 3 main progressions of Hollow. You can think of these progressions as different layers to add to your Handstand arsenal as you get stronger. Ok. So this is the introductory and most basic Hollow position of the body. 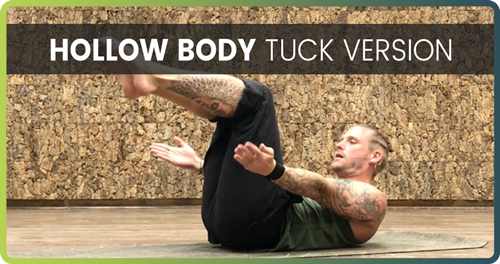 This position starts with you lying on your back, tucking your tailbone up and lifting your shoulders off the ground. We deliberately don’t bring the arms or legs into the equation yet, since we’re only focused the shape of the spine. Remember, this is the OPPOSITE OF BANANA BACK…so think of it like that. 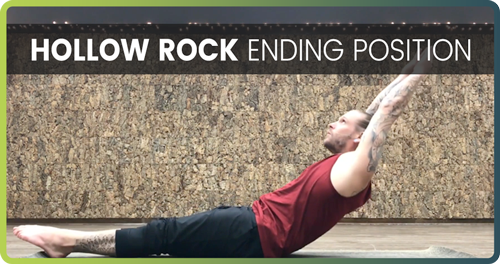 The next step in creating Hollow Body for your Handstand is to straighten out your legs. The tendency here to leave the legs lift in the air at around 45-degrees….Please do not do this. 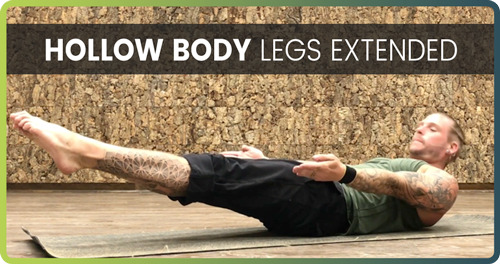 Train your body to lower your legs as close to the floor as you can without pulling your low back off the ground. While keeping everything you’ve already built: low back on the mat and legs straight out ahead of you, now raise your biceps past your ears like you’re mimicking the shape of Handstand on the ground. Keep your shoulder blades off the ground and shrug your Deltoids (shoulder muscles) up near your ears. This is the full form of Hollow! Remember to keep your lower ribs pushing toward the middle of your body ann continue to scoop your tail under. Get used to training longer and longer Hollow Body holds each time you practice. This is every student’s least favorite Handstand drill, and simultaneously one of the most effective…weird. 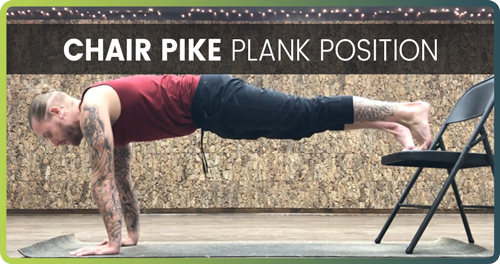 Once you get comfortable with this shape, you are on your way to a very strong Handstand practice! The Hollow Body shape is the backbone of your Handstand….pun intended. First of all, your hips are your center of gravity. This means that balance is more easily achieved when they are placed over the pivot point (fulcrum) of your lever. In this case, the fulcrum is your hands, and the lever is your body…Because Science. All my anatomy nerds out there just spit out their coffee because “hips” is way too broad of a term. I know it is, and the actual center of gravity in the human body is more precisely located at S2. But for the purpose of this Handstand tutorial, let’s use “hips” in the general sense. Proprioception: The unconscious perception of movement and spatial orientation arising from stimuli within the body itself. Essentially, your ability to understand where your body is in space without being able to see it…hmm…that sounds helpful in learning how to do a handstand. Just sayin’. Neuroplasticity: The brain’s ability to reorganize itself by forming new neural connections throughout life. Neuroplasticity allows the neurons (nerve cells) in the brain to adjust their activities in response to new situations or to changes in their environment. New situations? Like being inverted? Ah, it’s all coming together! Hey Poindexter, this is all great, but just how the f*ck does this help me figure out how to do a Handstand? By practicing new movement patterns over and over, you allow your brain/body to gain proprioception in these new positions, and more importantly, to understand the path it takes to get there. Practice something new until your body begins to recognize it as safe and easy, and abracadabra, Handstand! The easiest way to explain this drill is to imagine a boat at sea. The boat can shift and move as it slices through the water, but the boat never changes its shape to do so. In this drill, your body is the boat. Your only focus here is to move without changing shape. I know, it’s a new concept for a lot of people who do Yoga or Crossfit or Dance. These are all movement-based practices and usually involve you changing your shape as you move from one position to another. This drill asks you to change position AND keep shape, so if it feels awkward at first that’s totally normal. 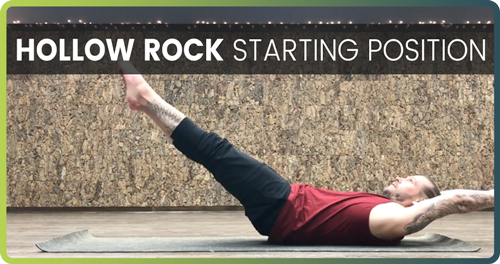 Come into your Hollow 3 (long Hollow), and begin to rock forward until your heels hit the ground, and then backwards until the backs of your hands touch the ground behind your head. Stay committed to your Hollow by hugging your belly button into your spine and pulling your bottom two ribs in towards each other. Rock back and forth until you can feel the movement coming from your middle. Keep your trunk tight and focus only on the rocking motion without vending any joint. Grab a chair or something of similar height. This is going to be the base for your feet, so make sure it’s solid. 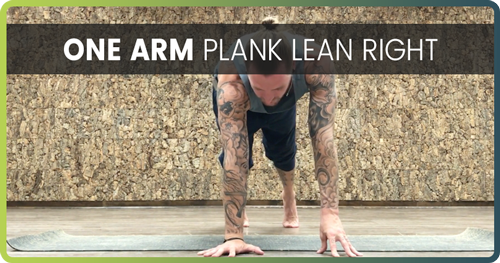 Now come into plank pose with your feet elevated on your new surface. From here, walk your hands backwards until your body makes an upside down letter “L”. Melt your chest between your biceps. This drill is tricky because you’re going to feel like you’re stacked before you actually are, so using a mirror or shooting a video with your phone is going to be super helpful! Once you get your body inverted, hold for time. Start with a simple set of 3 reps at a 5-count each. Then move up from there. This simple move will teach your brain/body how to do a Handstand in your wrists/shoulders/hips before getting your legs involved. Think of it as laying the foundation of your house first, and putting the roof on last. Scroll for more than 5 seconds on Instagram and you’ll see that Handstand comes in all kinds of flavors. 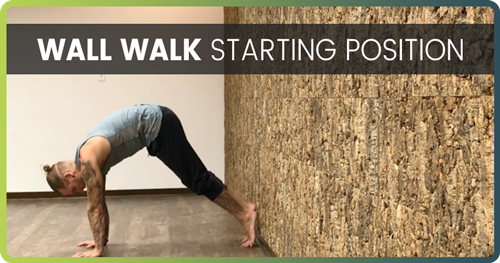 This is a great thing because it means you have options in this Handstand tutorial! For a second, imagine that Handstand can be represented by the number 4. Now, how do you mathematically get to 4? Well to start, all the fundamental math functions can get you there: addition (2 + 2), subtraction (5 – 1), division (8 / 2), multiplication (4 x 1). Easy enough. Also, you could even get there through more complex steps like square-rooting 16, or cube-rooting 64. Hell, you could go full-nerd on it and bust out some calculus. 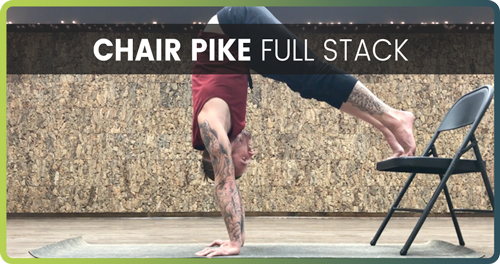 Now, is doing a perfect Pike Press harder than a single-leg kick? Yes. Is logarithmic calculus harder than basic addition? Yes. So if all of these things can get you to the same result, which one is the best? Whichever one you’ll practice the most. This ethos is not all that different from the old nutrition adage of “The best diet is the one you’ll stick to”. You may find that you have a lot of success with one entry or leg position, and thus you’ll end up practicing that one more. It totally makes sense. At the same time, be open to exploring the entries that aren’t the easiest for you. For example, do you have one leg that feels way more natural to kick with? And the other one feels like it’s not even connected to your body? Like it’s someone else’s leg? You’re not alone. We all have that.Stay disciplined and practice both legs equally. 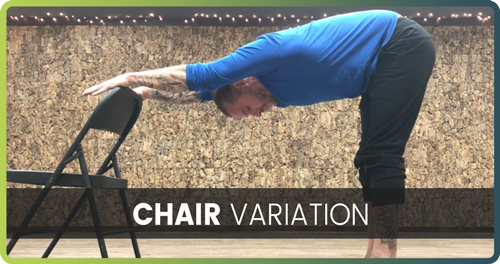 Also, your affinity towards one handstand variation in this tutorial vs another will change over time as your practice evolves. When I first started I was basically married to my left-leg kick. Then I stumbled onto the Crow-Tuck-Press variation, until I realized that I was doing my entire Handstand in my shoulders. These days, I find more control, ease, and stability with my Straddle entry because I’ve gotten more mobile in my hips. Tomorrow it might be something different. The point here is to always be curious and open to your options. Speaking of which, let’s take a look at the most common entry into Handstand. Watch the video at the end of this article also to hear me talk through the physics breakdown of this. Although you do need to bend your kicking legs to propel upward, straighten it as soon as your foot leaves the ground. Move your two straight legs from your heels. Get your top leg in place first and let your trailing leg meet it naturally. Avoid the temptation to rush and snap your legs together. This will undoubtedly cause you to tip over. Think of your trailing leg as parking a car in a garage. You don’t slam to a halt from 75 mph straight 0 mph. There’s a smooth slow down as your vehicle comes to a rest. 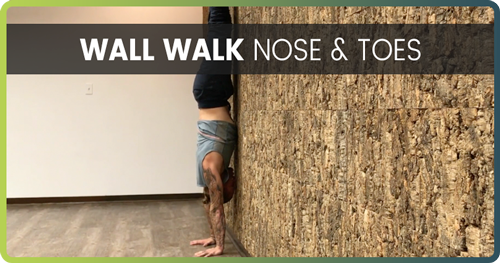 So grab the drills out of this Handstand tutorial that resonate with you the most and dial them in! Of all the Handstand tutorial drills you can do, this is the one definitive drill that I can say has changed my Handstand shape the most. 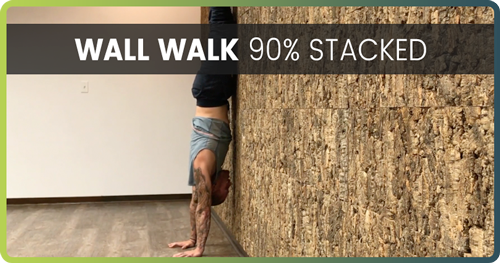 If you liked this Handstand tutorial, you’re going to want to check out my full online training program so you can unlock your Handstand strength and balance!